Aquands have a shallow profile and an impermeable layer that restricts water movement. Land use changes alter the physical structure of Aquands and soil air fluxes. The impacts of land use changes on the soil’s biological activity, nutrients’ dynamics, and the production of greenhouse gases (GHG) have not been investigated in Aquands. We investigated an Aquand soil under a second-growth native forest (sNF) and unmanaged naturalized grassland (NG) in southern Chile (41° S). Soil samples from each land use were taken in different seasons and analyzed in a laboratory to determine the potential soil respiration, N mineralization, denitrification, and nitrate reductase activity. GHG fluxes (CO2, N2O, and CH4) were collected from static chambers on the soil’s surface. 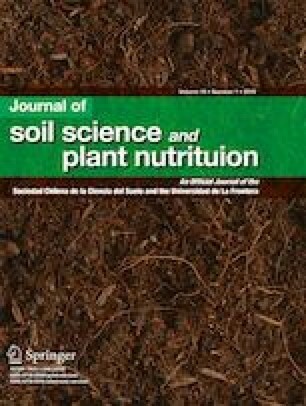 Soil respiration rates were higher in the sNF, but were temporally variable in NG. Nitrogen dynamics was not as clearly influenced by soil use changes. CO2 emissions varied seasonally and were always higher in the NG during the summer, suggesting a dependency on temperature and the changing thermal profile, while the N2O and CH4 in Aquands showed no evident spatiotemporal effects related to the historical land use change. Seasonal dynamics of water and air in the profile of Aquands are relevant for the biological processes related to C and N transformations. Land use change amplifies the production of CO2 under favorable conditions, but the biological activity of soil and nutrient dynamics of Aquands respond more to changes in soil organic matter quality than to seasonal variation in the edaphic environment. Nelson Beas thanks the Scholarship V/2015/741 from Universidad de Guadalajara, Mexico, which made his Master’s program at the Universidad de Concepción, Chile, possible. Finally, we are also grateful for the hospitality of the landowners Don Alfredo and Sra. Elba, and Katherine Rebolledo for her technical support on analytical determinations in the laboratory. This research project received funding from the Fondecyt grant 1130546.